If successful, the landing will make Israel the fourth nation to land a spacecraft on the lunar surface, and the first non-superpower to achieve the feat after Russia, the United States and China. But mission managers caution the landing is risky. The mission’s $100 million budget, relatively modest for a lunar probe, forced engineers to design a spacecraft with few backup systems, meaning a single failure in a critical component could doom the landing. “It’s extremely exciting, and quite risky,” said Opher Doron, general manager of the space division at spacecraft-builder Israel Aerospace Industries, in an interview with Spaceflight Now before the mission’s launch in February. “There’s no guarantee of success. There never is in space, but there’s even less so in this case. But we’ve done a lot of testing, a lot of engineering, and now we’ll be doing a lot of praying. Beresheet has already made history, when it became the first privately-funded spacecraft to orbit the moon last week. The descent is set to begin around 1905 GMT (3:05 p.m. EDT) Thursday with a braking burn with the spacecraft’s main engine to drop out of lunar orbit and target a landing in the Mare Serenitatis, or Sea of Serenity, region on the upper right part of the moon as viewed from Earth. Landing is expected around 20 minutes later, at 1925 GMT (3:25 p.m. EDT), according to SpaceIL, the non-profit organization that developed the Beresheet mission. 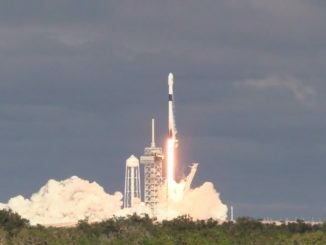 Beresheet, which means “genesis” or “in the beginning” in Hebrew, launched Feb. 21 from Cape Canaveral, riding as a piggyback payload on a SpaceX Falcon 9 rocket with an Indonesian communications satellite. After the launcher deployed Beresheet into an elliptical, or egg-shaped, orbit around the Earth, Beresheet used its own engine to boost itself farther from Earth, eventually intercepting the moon and completing a critical capture maneuver April 4 to enter lunar orbit. Additional engine firings during the last week maneuvered Beresheet into a tighter loop around the moon. The final major pre-landing burn Wednesday placed the spacecraft in an orbit with a low point just 9 or 10 miles (15 to 17 kilometers) above the moon, with a high point of about 124 miles (200 kilometers) in altitude. 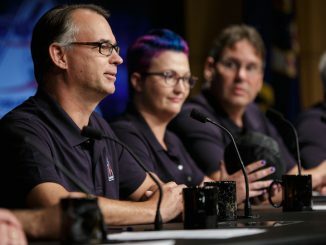 So far, the mission has overcome a pair of technical faults — an issue with the spacecraft’s star trackers and an unexpected computer reset. Thursday’s landing sequence will be entirely autonomous after ground controllers in Yehud, Israel, uplink the final commands for Beresheet to commence its descent. Beresheet will begin its descent at an altitude of about 15 miles (25 kilometers), roughly 500 miles (800 kilometers) from its targeted landing site, a few hundred kilometers from the location where the Apollo 15 astronauts landed in 1971. The lander will first switch on its laser landing sensors, which will feed data about the craft’s altitude and descent rate to a guidance computer responsible for commanding firings of Beresheet’s main engine to control its speed. Then Beresheet will begin pulsing its eight small control thrusters to get into the correct orientation to slow its speed and fall toward the moon, with its main engine facing in the direction of travel parallel to the lunar surface. If the spacecraft detects a problem during this phase of the sequence, it can automatically abort the landing and remain in lunar orbit. Beresheet’s main engine is a 100-pound-thrust (400-newton) LEROS 2b engine built by Nammo, formerly Moog, in the United Kingdom. The hydrazine-fueled engine is a modified version of a thruster typically used by large communications satellites. But the engine has never been used for a landing on another planetary body, and engineers had to update the engine’s design to allow for multiple “hot restarts,” when the lander will fire the engine in quick bursts to control its descent rate. The engine can’t be throttled to adjust Beresheet’s speed. Other changes to the engine included shortening its nozzle to ensure it could fit into the Beresheet spacecraft, which is about the size of a golf cart, and keep the thruster from hitting the moon’s surface. 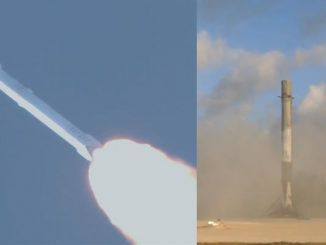 Nammo also made the engine more powerful for Beresheet by increasing its thrust. Beresheet will slow its speed above the moon from roughly 3,800 mph (1.7 kilometers per second) to zero, when the spacecraft should be an altitude of about 3,300 feet (1 kilometer). Using its laser landing sensors, Beresheet will know its altitude and speed as it begins a final vertical descent. After settling on the surface on its four landing legs, Beresheet will take a series of pictures, including images for a panorama to show the probe’s surroundings. The lander will also be programmed to record a series of images during the landing sequence to create a video of the descent. Beresheet’s sole active science instrument is a magnetometer developed by the Weizmann Institute of Science in Israel to measure the magnetism of lunar rocks. NASA provided a laser reflector on the spacecraft, which scientists will use to determine the exact distance to the moon, and to pinpoint the lander’s location. The U.S. space agency is also providing communications and tracking support to the mission. The German space agency — DLR — also helped the SpaceIL team with drop testing to simulate the conditions the spacecraft will encounter at the moment of landing. Having consumed much of its fuel load during the trip from the Earth to the moon, Beresheet is expected to have a mass of around 180 kilograms. Covered in a bright gold blanket of thermal insulation, the spacecraft would weigh about 400 pounds on Earth, but the moon’s gravity is six times weaker. The solar-powered lander is designed to function at least two days on the moon, enough time to beam back the mission’s scientific data and images. The laser reflector is a passive payload, and will be useful long after the spacecraft stops operating. Mission designers selected the landing site and landing date to allow Beresheet to arrive on the moon in the early morning, with the sun low on the horizon, when temperatures are not too cold or too hot. A day on the moon is equivalent to about four weeks on Earth, with the sun in the sky for two weeks at a time. Beresheet also aims to deliver a time capsule to the moon with the Israeli flag, and digital copies of the Israeli national anthem, the Bible, and other national and cultural artifacts. The Arch Mission Foundation installed a device on Beresheet it calls the “Lunar Library,” an archive of thousands of images and pages of text that can be read under a microscope. In addition to the analog archive, the library contains a digital archive with more than 100 gigabytes of highly compressed datasets, “including the text and XML of the English Wikipedia, plus tens of thousands of PDFs of books — including fiction, non-fiction, a full reference library, textbooks, technical and scientific handbooks, and more,” the Arch Mission Foundation says on its website. “The Lunar Library contains a 30 million page archive of human history and civilization, covering all subjects, cultures, nations, languages, genres, and time periods,” the foundation says. Three young Israeli engineers and entrepreneurs established SpaceIL in 2011 in pursuit of the Google Lunar X Prize, which promised $20 million grand prize for the first team to land a privately-funded spacecraft on the moon, return high-definition imagery, and demonstrate mobility on the lunar surface. The Google Lunar X Prize contest ended last year without a winner, but Beresheet’s backers kept the mission alive. Morris Kahn, a South African-born Israeli businessman and the mission’s largest single financial contributor, serves as SpaceIL’s president. Other donors include Miriam and Sheldon Adelson, a casino and resort magnate who lives in Las Vegas. IAI, the lander’s prime contractor, also invested some of its own internal research and development money into the program. The Israeli Space Agency awarded SpaceIL around $2 million, the program’s only government funding. 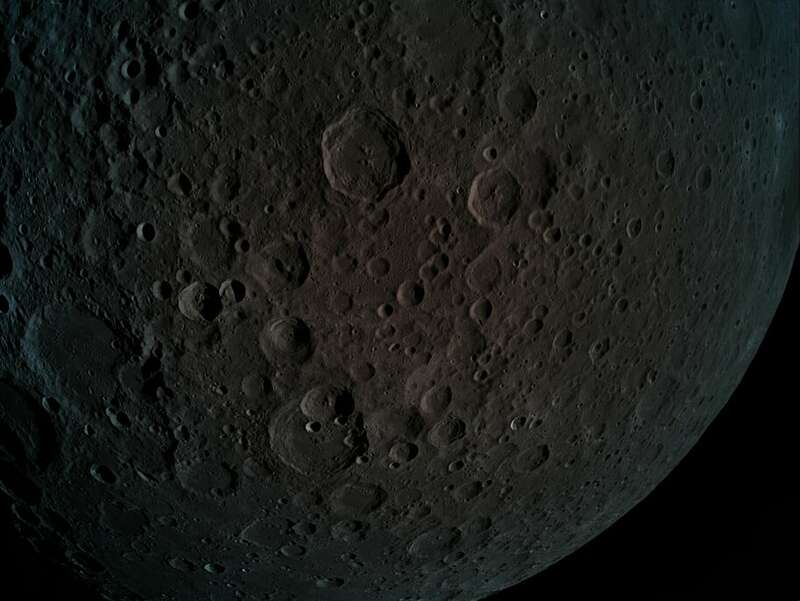 The X Prize Foundation, which organized the original Google Lunar X Prize competition, announced March 28 that it will offer a $1 million “Moonshot Award” to SpaceIL if the Beresheet mission successfully lands on the moon.